Did Henry Traber really pull a living trilobite from the Great Miami River in 1875? Was it only a fisherman’s fable? Or did Traber capture some unknown creature from the muddy stream? 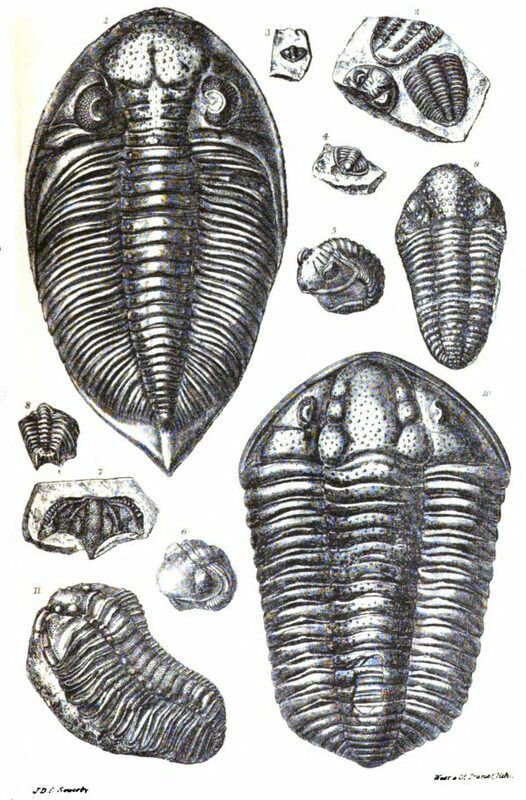 This antique plate from Sir Roderick Impey Murchison’s widely popular book, Siluria, illustrates the sort of trilobites found preserved in the rocks near Hamilton. There has not been a living trilobite for hundreds of millions of years. According to The Cincinnati Enquirer [24 October 1875], Traber really did pull something very unusual out of the Great Miami while on a fishing trip, with several witnesses. Accompanying Traber on this excursion were three other men: Jervis Hargitt, David Yeakle, and H.A. Dilge. All, including Traber, were residents of Hamilton, and all were Democrats and courthouse cronies. Hargitt was an attorney. Dilge worked in the auditor’s office. Yeakle was county treasurer. Traber, a former treasurer, had found himself a sinecure as the court house janitor. The quartet met at the Court House and walked down to the banks of the Miami, near the West Hamilton Hydraulic Dam. Hargitt and Yeakle were out for bass, and baited their hooks with minnows. Traber and Dilge were after catfish and used liver and crawfish. Fishing was good. By the end of the day, they had caught nearly 96 pounds of fish, with Yeakle’s string totaling 27 pounds, 3 ounces; Hargitt’s 24 pounds, 9 ounces; Traber’s 22 pounds, 13 ounces; and Dilge’s 22 pounds, 5 ounces. Although Dilge’s total was smallest, he had reeled in an 11-pound catfish. Yeakle had a 7-pound bass and Traber a 7-pound buffalo. But there was Traber’s strange catch. Now, Herman Reutti’s Saloon and Restaurant, located at the corner of High and Front streets in Hamilton, had undoubtedly witnessed a great many unusual occurrences in its day. But, a living trilobite? Maybe this was just one of his funny stories. Was his unusual catch really investigated by “gentlemen versed in natural history and geology,” or was that an ironic assertion? Keep in mind that, although this article appeared in The Cincinnati Enquirer, it was not written by an Enquirer reporter. The article was written by Henry Traber himself, identified as the historian of Hamilton Fishing Club No. 1. The Enquirer ran the piece as part of its regular column of Hamilton news. Henry Traber eventually left Hamilton to live near his daughter in New York. The Hamilton Fishing Club gave way to better government in Butler County. Herman Reutti’s restaurant is no more. And no one remembers what became of Henry Traber’s trilobite. Previous articleTraverse City’s Kayak, Bike & Brew is Like a Laid-Back Triathlon…With Beer!